While we are no experts on shoes, we have been able to try out our fair share of shoes on trail. We understand that there is not one perfect shoe for everyone and every foot out there, but we are really impressed by the performance and the versatility of the fit for the Odyssey Pros. 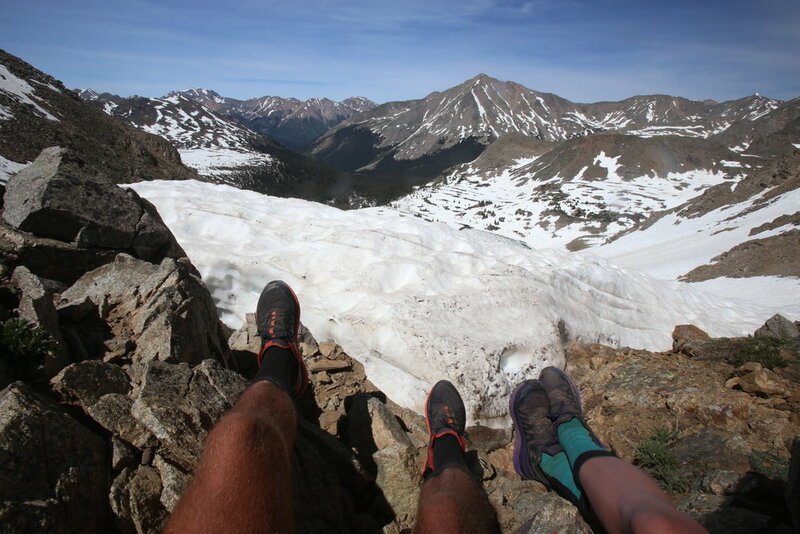 Before we started the Continental Divide Trail, Ethan had developed plantar fasciitis sending him in a panic to find a shoe that would help relieve it before 3100 miles of walking. After trying just about every shoe we carried at our local outdoor store, the pain persisted. Trying out a new shoe a few days before setting out on our hike seemed daunting, yet almost immediately after one day of wearing the Odyssey Pros, the pain began to diminish. Since leaving Nashville in April 2017 to start the Continental Divide Trail, we have put over 3,000 miles on three pairs of shoes. The first pair we put 750 trail miles on, and we are still putting miles on them. The second pair made it through 1400 miles (1000 for Critter), and the third pair finished the trail with at least 1000 miles on them, not to mention we are still wearing these, as well. We have done these miles through arguably the most inhospitable terrain in the US, all while wearing pretty heavy packs. Most trail runners give little support while reducing the weight of the shoe, yet these shoes gave better support than most boots. For now, these are the only thru-hiking shoes for us, and it did not take walking across the country to convince us. ANATOMY OF THE SHOE| If you were to venture out to trail during thru-hiking season, you would quickly notice a lot of trail running shoes being worn by hikers. If you did not see actual shoes, you would definitely see fossilized footprints in the dirt tracing back to companies such as La Sportiva, Brooks, and Altra. The trail runner provides lightweight comfort with maximum breathability. However, Salomon noticed that the trail runners being used during these long distance hikes fell apart after 500 miles, which is the typical lifetime of a shoe of that nature. They set out to make a shoe that had all of the benefits of a trail runner with the reliable durability and support of a shoe that could endure the distance. There is a lot that goes into creating footwear, especially for an innovative company like Salomon. When trying to understand a shoe, you have to consider that every piece of it is there for a reason, every decision made in the design has a purpose. With that idea in mind, let’s break down the anatomy of the Odyssey Pro. Before and after 750 miles through New Mexico on the Continental Divide Trail. UPPERS: The Odyssey Pros sport a quick-drying and breathable, lightweight mesh upper, making them a great option in warm temperatures and wet conditions. In cold weather and if paired with a merino wool sock, the shoe and sock function well to regulate foot temperature so that you don’t get too cold or too warm (sweaty feet equal cold feet in cold temperatures). Since the mesh is porous for breathability, you do have to be careful on sandy terrain or get in the habit of emptying your shoes out frequently to prevent blisters. Sensifit™ wraps the foot from the mid-sole to the laces, providing a precise and secure fit. The gusseted tongue helps secure the fit as well as helps reduce the amount of debris that gets into the top of the shoe. Our Thoughts: We were honestly impressed with the upper of the Odyssey Pros. When we first received them, we initially concluded that they were flimsy since there did not appear to be much reinforcement to the mesh. However, we were proven wrong very quickly on trail. The same spots did wear out on each pair of shoes at about the same time but considering the amount of river crossings and bushwhacking, as is the nature of the CDT, we were pretty impressed. LACES: Quick laces, a staple of Salomon running shoes, were traded in for flat conventional shoe laces on the Odyssey Pros. The flat shoe laces allow for full control over contouring the shoe to the shape of your foot, and you do not have to worry about sand, dirt, and general grime clogging the barrel lock of the quick laces. Our Thoughts: We definitely prefer the traditional laces over quick laces when it comes to long distance hiking. They were fairly low maintenance. For M.E., these were one of the first things to bust, but it was a pretty easy fix with a strong knot. Ethan never had any issues with the laces busting, but does not tie his shoes very tightly. We would definitely recommend double knotting them since they seem to come untied frequently if you don’t. INSOLE: Salomon outsources insoles from Ortholite. Made from a polyurethane and recycled rubber-based formula, Ortholite is an open cell foam designed to provide long-lasting cushioning, breathability and durability. Our Thoughts: Personally, we both traded out the insoles that came in the shoes with our own insoles (M.E. with SuperFeet Green Insoles and Ethan with Columbia Montrail Insoles). We have both put 200+ miles on a pair of Sense Rides with Ortholite insoles, and we have no immediate negatives that we can think of. The main reason we used more rigid insoles was due to the extra weight we carried on longer stretches. Ethan also started the hike with a foot injury, so extra precaution was taken. MIDSOLE: The Vibe Technology is one of the Odyssey Pros' most valuable features. Developed to reduce vibrations and increase energy return with each step, the design results in less muscle fatigue over time and helps prevent injuries due to constant impact. Vibe technology can be seen in Salomon running shoes, and it only makes sense to add it to a long distance shoe like the Odyssey Pros. (Get ready for science class...) The components making up the midsole are a firm layer of EnergyCell+, with Opal and Thermoplastic Polypropylene (TPP) inserts. EnergyCell+ is a compression molded EVA midsole, providing slight rigidity to the shoe helping on uneven terrain, high rebound and shock absorption. The Opal inserts help cut down weight for the entire shoe, as well as reducing vibrations from side-to-side forces in the high impact zones. TPP is lighter weight and softer than TPU (thermoplastic polyurethane), used by other popular brands. Together the EnergyCell+ and Opal technologies provides long-lasting comfort, cushion, and durability to help the Odyssey Pros withstand the distance and wear of a thru-hike. Our Thoughts: The Vibe Technology is really the magic of the shoe allowing the shoe to easily become a workhorse in its field. 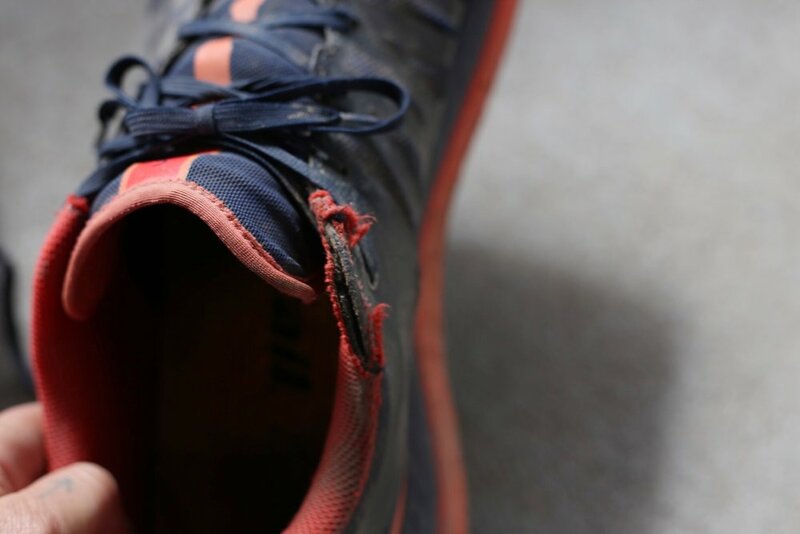 The mid-sole was the last part of the shoe that we saw wear down after 1,000 miles, and even then, compression of the mid-sole was only evident by look not by feel. Our legs experienced less fatigue (such as Shin splints) than we have experienced in previous shoes. The mid-sole and sole provided a good rock plate for all the different types of trails we hiked. Profile of M.E. 's shoe after 750 miles on the CDT. Tread of M.E. 's shoe after 750 miles on the CDT. SOLE: Contagrip® is the proprietary rubber used on for the outsole on Salomon shoes. Twenty different ingredients create eighty different compounds that allow each shoe to have the best rubber for its intended activity. For the Odyssey Pros, designers took in mind the high mileage and wide terrain of thru-hiking and designed a lug pattern that would best suit the shoe. The waffle grid pattern benefits from a high surface area of rubber tread, so the outsoles can handle 1,000 plus miles before wearing down. Our Thoughts: The sole of these shoes is deceiving. At first glance, it looks like a classic waffle pattern. This design however was perfect for thru-hiking due to its non- aggressive lugs, since you switch back and forth between a variety of terrain. The tread not only gripped well on snow, slick rocks and uneven trail, but also kept its distinct design after 1400 miles. The sole had enough volume that briers and other prickles would not reach the insole. The out-sole was the last part of the shoe that we experienced wear down. 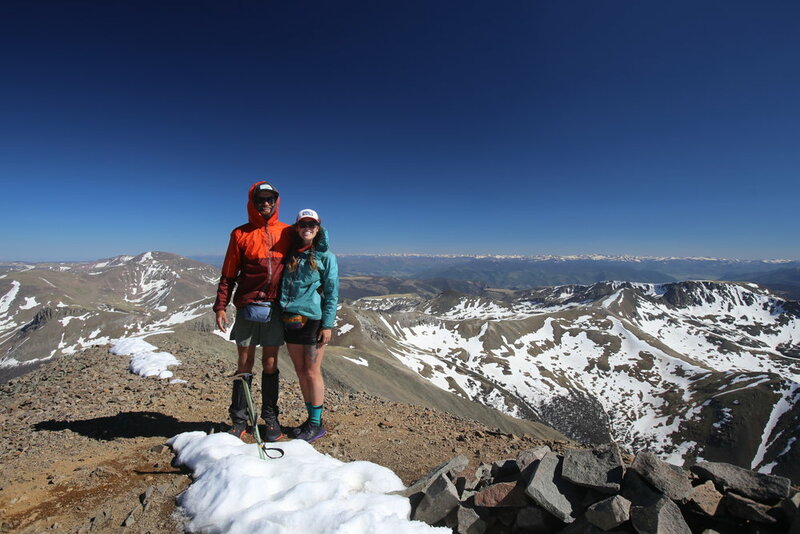 We were really pleased with the out-sole on the Odyssey Pros, and the hikers behind us were surprised by how strong of a track that our shoes left, even after several days and other feet passing through. One couple was shocked at how our footprints, made several days before them, looked fresher than their own fresh footprints. Our footprints also caused some hikers to crave Nutter Butter cookies. FIT| The Odyssey Pros have a simple fit, which is ideal in a thru-hiking shoe. You do not need all the bells and whistles in a shoe that will be put under heavy loads and high mileages. The importance comes from the shoe being built intentionally with quality materials and a simple fit. Typically, Salomon shoes run narrow. However, when designing the fit of the Odyssey Pros, they were more generous in the toe box. The Sensifit™ upper and lace system help mold the shoe to your foot, but the extra room in the toe box helps the foot spread in a comfortable way assisting in an overall more natural ride. A true "narrow" foot may have difficulty wearing these shoes. Ethan's Thoughts: I have a narrow heel and wider forefoot and wear shoes anywhere from a size 12 to 14. The Odyssey Pro in a size 13 fits me perfectly. This shoe fits very true to size. My feet do not swell significantly over the course of a long hike. If this is not the case for you, sizing up a half size is always a safe bet. M.E. 's Thoughts: I have wide feet and a low arch. I typically wear a 7 to a 7.5 depending on the shoe, but a size 7 flexes more naturally with my foot. I wear 7’s in the Odyssey Pros. They allow my toes to splay out organically and each step to feel natural. I did go up to a 7.5 to accommodate for foot swelling, normal for a long distance hike, but after returning home, I went back to the 7’s. Being a roomier shoe did not result in them feeling sloppy, which is how I feel in some other “wide” shoes. Needless to say, all of the things we have experienced were normal wear and tear from strenuous miles filled with sand, razor sharp lava rock, highway walking and deep snow. WHAT WE DO NOT LIKE| It sort of feels like we are just trying to find something that we did not like about these shoes among a sea of reasons why we love this shoe. However, there are a couple of areas on the upper that we saw recurring wear over three pairs of shoes. 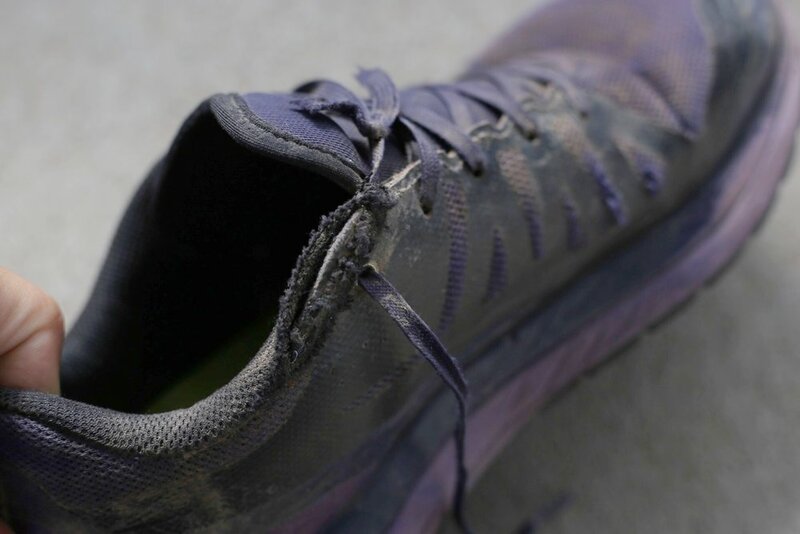 There could be reinforcement on these areas that would add to the durability of the entire shoe, but it is not worth jeopardizing the breathability and their light weight. The shoe laces always gave M.E. a good surprise when they popped, but it was nothing a good knot couldn't fix. WHAT WE LOVE| The gusseted tongue. Every once in awhile a small pebble got in the top of the shoe. The other ninety nine percent of the time, this feature kept us walking happy, free of dirt and debris from the trail and lack of trail. The Contagrip® tread. This sole has to be the toughest sole on the market. We put the shoes through thorns, sand, water, lava rock, snow, and more water. Even after 700 miles the sole showed some wear without much receding of the rubber.